In one respect, it could not be easier. Build a coastal trail linking three regional parks, all on publicly owned land. However, if it had in fact been easy, it would have happened soon after Mahurangi Action first suggested it, three decades ago. The first big hurdle—convincing senior regional parks management that Te Muri could be viably accessed by foot, and should be preserved from car access—took, on and off, 28 years. The decision that Te Muri would remain car-free forever was formalised in January 2017. 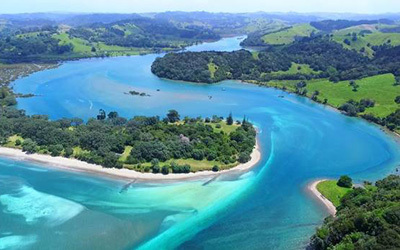 The greatest physical challenge, however, was always going to be crossing the Pūhoi River, which at the widest point of its estuary is nearly half a kilometre across, and at the narrowest can be very fast-flowing. Initial thoughts were of a laminated wooden structure, launching off the cliffs on the northern side of the river mouth, and with sufficient clearance to not impede the loftiest yacht likely to venture into the river. When the coastal trail concept took on urgency, upon the purchase of the farmland behind Te Muri in 2010, and with it the spectre of car parking for thousands behind the beach, dominating the river mouth with anything approaching a 30-metre-high structure was not remotely a starter, with the intervening elevation of concern for landscape and visual impact. So, the attention moved much farther up the estuary, past its widest point, but where it was, nevertheless nearly one third of a kilometre in width. An obvious requirement was for the bridge to incorporate an opening span, to allow masted vessels to access to the balance of the navigable river upstream, as defined by State Highway 1. Aware that visual impact was the deal breaker, a footbridge was designed that took a sinuous route that sought to complement the curvaceous tidal channels, but even its biggest fan couldn’t claim that it enhanced this estuarine Eden. Thus, it was less-than-surprising when the potential benefits of the coastal trail were insufficient to outweigh objections to the likely visual impact of a 280-metre-long structure on the estuary. Another possibility is the provision of a chain cable ferry. Such ferries are common throughout Europe. This could be self-operated by people wanting to access Te Muri from Wenderholm and could become a unique attraction in itself, without the need for large infrastructure crossing the river. The trust immediately embraced the chain ferry option, believing that its challenges could be met, and that the effort would be more than justified, to create such an attraction and realise the coastal trail. Choice of crossing point was the first consideration, and a tidal estuary is a challenging location for a cable ferry. Firstly, in the case of the Pūhoi Estuary, there is the great width involved. With cables in the order of 280 metres long, even a small ferry, with the all-up weight of a tonne, could easily impose a load of 10 tonnes or moreassuming an about 6-metre sag in the cable on a winch, when wind and tide caused the craft to surge sideways. But secondly, and this is the show-stopper, without building boardwalks almost as long as the footbridge explored and rejected, an all-tide service could not be provided. The raison d’être for the Mahurangi Coastal Trail, and hence the Pūhoi River crossing, is to provide access to Te Muri, to maintain its sense of splendid isolation, which would be destroyed were it given over to car parking. The current access to Te Muri is tide-dependent, and while that is a significant part of its appeal for many adherents, it does severely curtail use of that regional parkland. Having spent $15 million alone acquiring the adjoining Te Muri farmland, Auckland Council cannot in all conscience other-than allow reasonable access. This dictates that access from the south—the direction in which most potential park users reside—across the Pūhoi River, must be all-tide. And the only point within the regional parks, or within cooee of them, where an all-tide cable ferry could operate, is at the river mouth. Even 50 metres upstream, the channel bifurcates, and the ferry would strand partway across. Although the river mouth provides an uninterrupted all-tide body of water with a mean-low-tide depth of a couple of metres, and is hidden away from most park users, it is a place of outstanding natural beauty. 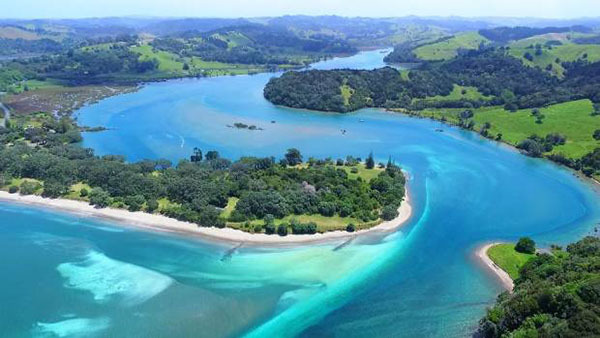 Jetties and a cable ferry that would be entirely congruous in many river settings, would scream sacrilege in the Pūhoi River Mouth, which is why the trail trust is contemplating something altogether more sophisticated. Instead of fixed structures that would visually fence off all but a 40-metre gap of the 94-metre bank-to-bank opening, gracefully curving gangways that follow the shoreline contour and advance and retreat with the tide, have been devised. They, and the ferry, will be designed to complement each other. The visual objective is to evoke delight, rather than disappointment, when regional park users round the turn of the Wenderholm spit, and encounter the cable ferry for the first time. Then there is the question of how the ferry itself engages with the river. Cable ferries fall into two broad categories, one of which is the reaction ferry. The only cable ferry Aotearoa boasts is the Tuapeka Mouth reaction ferry, which crosses the Clutha River just downstream from its confluence with the Tuapeka River. Australia, in contrast, is home to 28 cable ferries, few, if any, of them being reaction ferries. The Clutha River, with its strong current flow from bank to bank is an ideal location for a reaction ferry, given that the propulsive force is derived from the ferry, tethered to a point upstream, reacting to the current, when its bow is angled towards the destination bank. 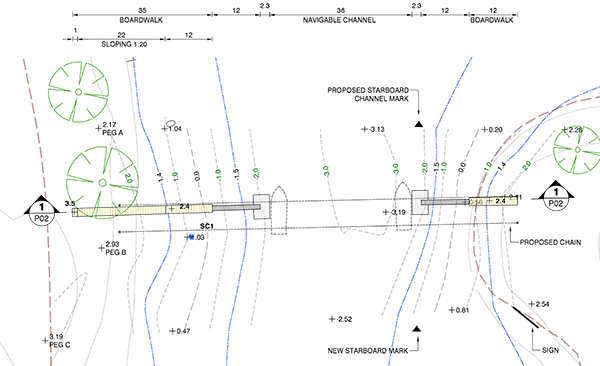 There are other varieties of reaction ferries, including one in which the tether attaches to a traveller running on a taut aerial wire stretched from bank to bank farther upstream, or when the ferry is alternatively tethered from one bank or the otherbut requiring additional energy to draw the ferry upstream as it crosses, so as to coincide with the destination landing. 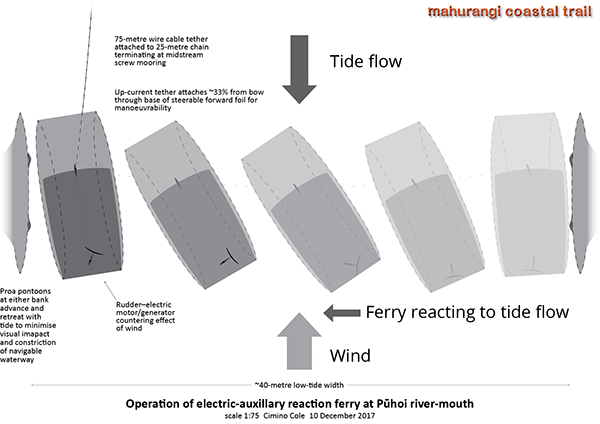 Given its alternating tidal-flow direction, separated by periods of slack water, the Pūhoi River Mouth is not an immediately obvious reaction-ferry location. That meant that the cable-ferry type so common in Australia, where the ferry is simply winched from one bank to the other, was the starting point for the trust. But the Wenderholm shore of the Pūhoi River Mouth receives a significant amount of use, by walkers and paddlers, and swimmers—despite signs direly warning the latter of the risk posed by currents that, at peak flow, would defeat an Olympic medalist—supposing she was sufficiently unwise to attempt to swim against, rather than across, it. This activity could all too readily result is park users being injured by the ferry’s cables, where they came ashore to their anchor points. This hazard, aside from any other consideration, had the potential to deny the project the resource consent that is the next major milestone in creating the Mahurangi Coastal Trail. Because reaction ferries typically use a midstream mooring, in this case, in water several metres deep, it was decided to revisit the option. Reaction ferries have much to like, particularly post anthropogenic global warming awareness; they are zero-carbon. The primary challenge, of course, is the need to operate on both incoming and outgoing tides. This means one tether anchored upstream and another anchored downstream, only one of which would be active at any given time. So far so difficult. But between each tide, the ferry must be able to continue to operate, and peak demand, from time to time, will coincide with slack water. The concept that has emerged is possibly unique: A 100% river-powered hybrid electric–reaction ferry. During the greatest part of the tidal cycle, when there is appreciable river flow, a propeller—or more properly, a turbine—would turn a generator and the resultant electrical current would be stored in batteries carried aboard. Then, at slack water, the job of the turbine and generator is reversed, to propel the ferry from shore to shore, much as a conventional ferry would operate, free of either tether. Then, as the tide began to flow appreciably, the ferry would pick up the upstream tether, from where it had been temporarily made fast to a dock, and recommence operation as a reaction ferry, for the following four or five hours. While a fossil-fuelled genset could be carried as backup, or indeed a fossil-fuelled outboard motor, the currency generated by the 100% river-powered boast is too important to be devalued by disclaimers. Against a backdrop of about 200 000 trailer boat users reporting an equivalent of a total of 50 million litres of fuel per year each, the amount of fossil fuel burned by even a 100% fossil-fuelled ferry could be robustly defended, given its public transport role in facilitating walking. But fossil-fuel-free, the ferry will attract far fewer critics, and a thousand-fold more fans. 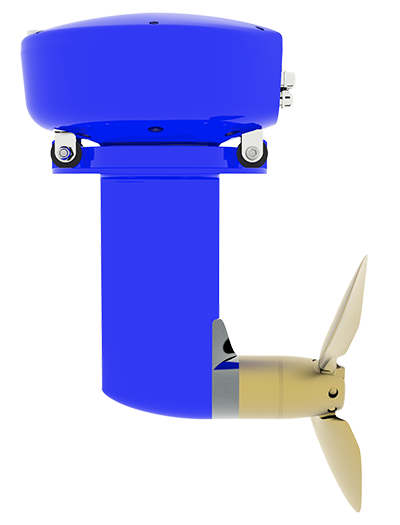 optimised to be propelled with minimal energy, when river current alone is insufficient. a combination of direct and indirect river-power. The ferry must be optimised to turn efficiently. If turning efficiency was the was the prime design prerequisite, a catamaran would not be considered. But the catamaran form is so superior for passenger carrying stability, and particularly for passenger disembarkation, when much of the weight can be overwhelmingly on one side of the craft, that a monohull form would struggle to pass muster with Maritime New Zealand. The challenge then is to design the hulls to turn happily. Happily, the designer is already helped in this direction by needing to keep draft to a minimum, dictated by the need for the ferry to leave the maximum width of the river mouth open, for other users; shallower hulls, inherently, are more easily turned hulls. A traditional reaction ferry, in contrast, can make a virtue of ‘grippy’ hulls, to help harness the power the current to propel it across the river. But because of the prerequisite to readily turn, the river-mouth ferry, instead, will use foils, in the form of a centreboard and rudder. And that is centreboard singular and rudder singular, not centreboards and rudders, both for manoeuvrability, and to keep draft, under the hull that happens to be closest to the shore, to a minimum. Also for maximum manoeuvrability, the propeller will be rudder-mounted, and capable of turning through 360⁰—readily achieved with electric drive. The centreboard, too, will pivot, but will possibly only need to turn a maximum of 20⁰, to give the bow a good initial shove out into the stream. During other manoeuvres, anything like 20⁰ would tend to stall the foil and waste energy. The other major service performed by the centreboard is to provide the perfect tethering point, about a third of the way back from the bow, because attached to the bow itself, the tether would tend hold the ferry parallel with the current, and resist the efforts of the foils to do their job. Also, being attached to the base of the centreboard, the tether wire is kept closer to parallel with the horizontal river flow, reducing drag, and is kept well below the surface at all times, to avoid any possibility that it fouled the propeller or other appendage of a passing boat. With the tether attachment point established—the pivot point of the craft—the rudder is than placed as far away as practicable, in the stern, where it can provide greatest leverage against the forward foil, being the centreboard. This configuration means that when the vessel is turned, the after sections of the hulls slide sideways more than the forward sections slide sideways in the opposite direction. This dictates that the hulls be flatter in section in the stern than in the bow, where being finer is an advantage for piercing choppy water. Broader stern sections are also more buoyant, meaning that the batteries can be stored closer to where the electricity is stored and used. The mission of turning the various criteria into a handsome vessel is principally that of a boat designer, a local recommended by Core Builders Composites, when the need for building an ultra-low-maintenance vessel was being discussed. The advice of the Warkworth-based company, world-famous as Oracle’s boat builder, was sought after the low-maintenance attributes of its solution for the Auckland Harbour Bridge SkyPath received publicity. Because the designer, Tim Clissold, was in Bermuda working with SoftBank Team Japan, the coastal trail trust was obliged to bide its time planning other aspects of the ferry operation, including a survey of the river-mouth topography and tidal flows, and contemplation of the shore structures required. 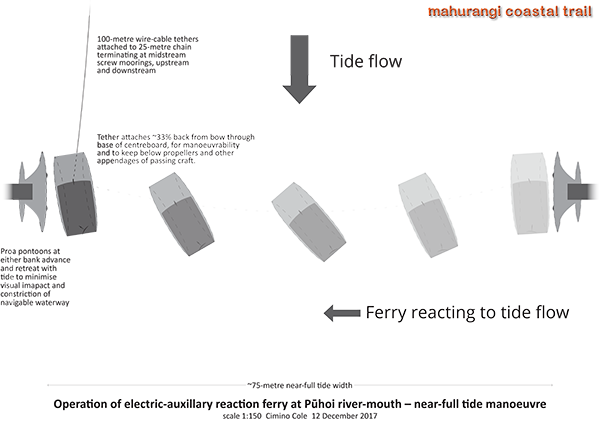 In a perfect world, a Pūhoi River Mouth ferry service would evolve from small beginnings. The river mouth, like all those along the Mahurangi coast, once had a resident ferryman on a council retainer, available for folk to pay to row them across the river. It was only as recently as the late 1930s that all-weather roads put an end to the coast’s steamboat era, and simultaneously ending the demand for river mouth ferry services to develop beyond rowed boats. From 60 years on, resource management bureaucracy, brainchild, in Aotearoa, of the Labour Party’s Geoffrey Palmer, has made incremental development difficult. In the case of the Pūhoi River Mouth ferry, under a less monolithic regulatory regime, a small-capacity service, costing a few tens of thousands of dollars, might have first been trialled. However, as challenging as it is, it is perhaps a good thing that the regulatory landscape favours do-it-once-do-it-right, because patronage, from the first few months of operation, is likely to grow exponentially. The Wenderholm spit, and particularly the site of the ferry landing, is extremely vulnerable to anthropogenic sea-level rise. This means that every practicable effort must be being taken to protect and enhance the spit’s sand-binding plants that are so critical to sand accretion. Meanwhile, the greatest threat to these plants is trampling by animals—in this case, Homo sapiens sapiens . This dictates that the ferry operation must result in less trampling, rather than more. The trick is to make sand-binding-plant-friendly access to the ferry literally the path of least resistance, and likewise provide for other walkers in area. This is just one of the considerations in designing the extensible gangways, which, on the Wenderholm side of the river mouth, will bridge the sensitive area. Done right, and the overwhelming response of ferry users and other walkers will be appreciation, rather than annoyance, for the route they find themselves taking. And that, in fact, is the overall goal of the design team, which includes Davis Coastal Consultants, TC Design, and White Landscape and Urbanism. The overwhelming response of people seeing the operation for the first time must be delight, not dismay. Really like the progression of the idea and where it has got to with the application of simple fluid mechanics – uplifted! …and that, might be the most uplifting comment the Mahurangi Magazine is ever to receive; thank you so very much Stephen!